Xylem Inc, headquartered in Rye Brook, New York, has unveiled its newly enhanced Flygt 4460 mid-sized biogas mixer. Designed in response to specific customer needs, the new submersible mixer has been expertly designed for easy installation in biogas digester tanks, supporting the process of turning wastes into renewable energy resources. For optimized cost-effective mixing, the Flygt 4460 biogas mixer has been upgraded with a duplex steel propeller specifically designed to perform in thick, viscous liquids and to endure abrasive and corrosive materials. The improved efficiency means that mixing time can be reduced, and significant energy savings can be realized. 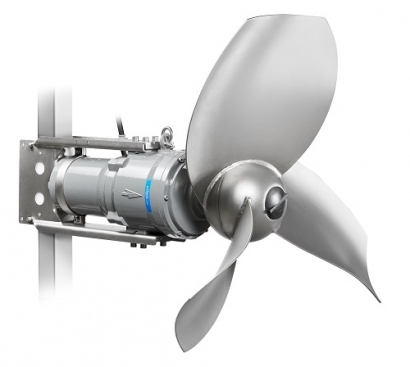 Reliability is also enhanced by the propeller's spherical hub, which guarantees continuous clog-free mixing, as well as the 7.5 or 12 kW Flygt motor and heavy-duty gearbox for energy-efficient, non-stop performance that meet the most challenging process demands. The new propeller comes in two diameters, 1.0 and 1.25 m, and can easily be installed and positioned through the tank's standard openings using Xylem's installation system. Maintenance is quick and safe as the mixer can be lifted straight out of the digester without having to empty the tank. This significantly reduces operational down-time and over-all servicing costs. Commenting on the launch, Maja Rosiak, Biogas Segment Manager at Xylem said, "Biogas production is a complex process, but with more than thirty years of experience in the biogas market, Xylem has a thorough understanding of the challenges involved. We have equipped more than 6,000 biogas plants worldwide, and our enhanced biogas mixer has been specifically designed to handle even the most demanding conditions. Fully submersible mixers, with depth and angle adjustment, offer the most flexible configurations for the highest energy efficiency and long mixer life-time. We are delighted to bring this new and improved product to market to manage our customers' mixing challenges."